If your order weighs less than 13 ounces, save huge on shipping with USPS first class (with tracking number). This product weighs 1.7 oz. 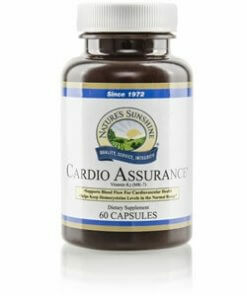 Nature’s Sunshine Cardio-Assurance combines herbs known for their powerful benefits for the cardiovascular system. Hawthorn, scientifically proven to support heart and circulatory health, is rich in flavonoids that contain antioxidants and that encourage healthy blood flow and keep the arteries healthy. Vitamin K2, another key ingredient in the Cardio-Assurance formula, may help in weight management by supporting the body’s ability to synthesize insulin and store less fat. 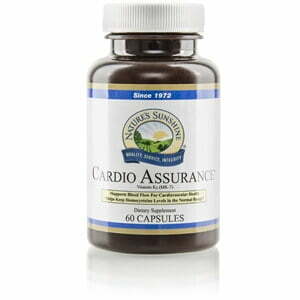 Cardio-Assurance also contains resveratrol, folic acid, vitamin B6, and vitamin B12, all which combine to provide powerful protection for the heart and its systems. Cellulose (plant fiber), maltodextrin, magnesium stearate (vegetable), silicon dioxide (powdered silica), gelatin, and water.